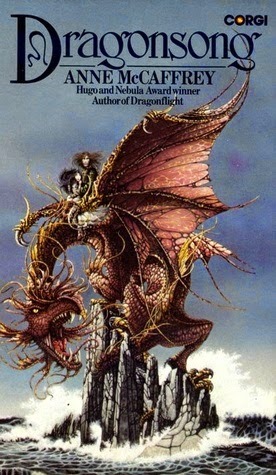 Dragonsong is a bit of an oddity when compared to the other books in the Dragonriders of Pern series. In some ways, it works to its advantage but in other ways it’s boring when compared to the first two books in the series. What follows is part review and part comparison with Dragonflight and Dragonquest. I would compare it with other books in the series but I haven’t read them in years and I cannot trust my memory to provide me with information accurate enough to make the comparison worthwhile. 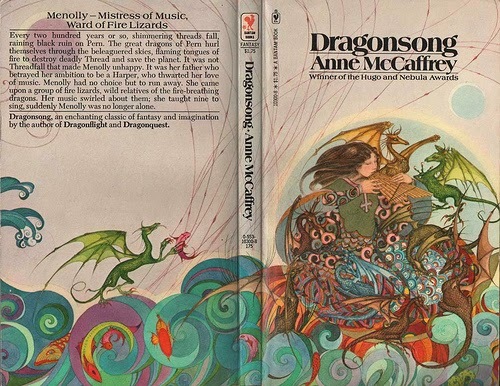 The biggest difference between McCaffrey’s first two novels in the series and Dragonsong is that the latter is written specifically for the young adult market. In fact, the entire Harper Hall trilogy, of which Dragonsong is but the first entry, is targeted to young adult readers. It was the idea of her editor Jean E. Karl who having a new imprint for young readers at Atheneum Books asked McCaffrey for a story. The goal was to attract more female readers to science fiction and fantasy. Knowing this actually increased my appreciation for Dragonsong but not really my enjoyment. It’s a fine novel for young readers, specifically girls, but it’s not a very good Dragonriders of Pern book. Simply put, the novel didn’t quite fit in with its predecessors and it made for an underwhelming read. 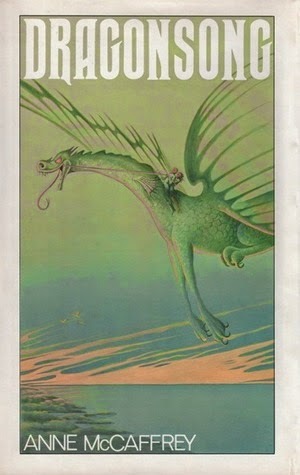 Originally published in serialized form beginning in July 1968, Dragonflight was collected and released as a novel in 1969. Shortly after a sequel, Dragonquest, was published in May 1971. These novels make up two thirds of the first Dragonriders of Pern trilogy which was concluded with The White Dragon. 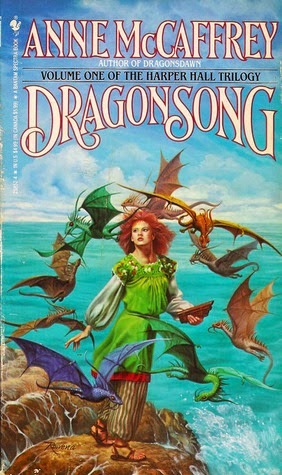 Before McCaffrey went on to complete her first trilogy, she wrote two thirds of a second trilogy, called the Harper Hall trilogy of which Dragonsong is the first volume and was published in March 1976. The last book in the Harper Hall trilogy was published after the release of The White Dragon. The first trilogy is clearly targeted at adult readers due to the inclusion of themes that deal with gender politics and sexuality. They also have a few violent scenes (McCaffrey is good at writing knife fights) thought by today’s standards, those wouldn’t be out of place in a young adult novel. The second trilogy is targeted at a young audience and it shows in the story. It’s odd that both trilogies are entangled so during their initial publication. I do not see the benefit of this aside from the fact that McCaffrey had an offer for a particular book and she went ahead and wrote it without finishing her first trilogy. That in itself is fine, but it causes a bit of a problem for readers who are new to the series and are trying to read the Dragonriders of Pern in the “correct” order. That’s actually simple to do if you’re not interested in reader the young adult novels of the series. Just skip them and move on ahead to The White Dragon. I didn’t want to do that. I’m curious as to how the young adult Pern novel stands up. I’m also curious as to how its story fits in with that of Dragonquest. As it turns out, it doesn’t have much of an impact at all but it does provide an opportunity for the reader to enjoy scenes from Dragonquest from a different point of view. Two of those stories include Brekke’s healing process after the loss of her gold dragon and the hatching of Ruth and his impression to Jaxom. It’s nice to have the new perspective on those events but it only works if you’ve read Dragonquest. I’m certain that readers who aren’t familiar with the overall setting of Pern have no bearing to help them appreciate the second perspective. In other words, those events don’t have any meaning for readers unfamiliar with them because they’re taken out of context. The type of story told in Dragonsong is very different from the first two Pern novels. If you continue to compare Dragonsong with Dragonflight and Dragonquest while reading, you likely won’t enjoy this book much. Yet Dragonsong has plenty of good stuff to offer, particularly to young female readers. The story’s basic theme is that due to the fixed gender roles of Pern, Menolly is denied the freedom to pursue her dream. Her father specifically forbids it but her mother supports her father’s decision and likewise, the rest of the village is in passive agreement of it. I say passive because they do not specifically try to stop Menolly from pursuing her dreams and her passion for music but they do nothing to encourage her. As the story progresses Menolly is given opportunities to continue developing her talents in music as well as a way to escape from the confines (both physical and mental) of her village. Her arrival at Benden Weyr makes it look like a very progressive place in comparison to Holds and small villages. That’s kind of strange considering just how odd and constricting gender roles have been presented in the previous two novels, at Benden and elsewhere on Pern. Dragonsong is essentially a young woman’s power fantasy. Menolly is good at everything and she’s the main character in a story that is concerned, primarily, with showing the reader just how perfect she is. Of course, for it to have any meaning and emotional importance for the reader, her dreams are heavily discouraged in the first third of the novel. The rest though, is all about Menolly excelling at every challenge and task that bars her way. I have nothing against such a novel. In fact, I think it’s an important novel due to its theme and focuses on a female lead, even in today’s market. The problem is that as an adult male, I appreciate the book more than I like it. I quite enjoyed that we get to see the role of a Harper in action. We get to see the importance of Harpering in Pernese society. We’ve been aware of the existence of Harpers since the very first novel and we know that they’re entrusted with the job of sharing knowledge and history through songs and poems. Teaching ballads play an important role in the education of children as well as the continuing education of entire Holds. That makes sense considering the type feudal-like society that inhabits Pern. Why then would Menolly’s father be so opposed to the idea that she could become a Harper? Simple, Pern isn’t a planet of equal opportunity, especially not in small Holds where every able bodied person is expected to pull their weight in the development of local economy. In Half-Circle Sea Hold that’s fishery. There are things about the novel I simply don’t like. Fire lizards are not replacements for dragons. The focus is too small. I liked the large canvas that McCaffrey used in the first two novels. There is a planet wide scope and I liked it. Dragonsong also has a predictable story and it doesn’t offer any surprises. I think that’s due to the target audience more than anything else. It’s a simple and straightforward story. Still, young readers are capable of understanding beyond what adults think young readers can manage. The book doesn’t pander to the reader but it doesn’t challenge them either. The prologue does a good job setting up the location of Pern and the threat of Thread. It’s a nice, succinct introduction to Pern and it’s pretty essential in establishing the planet as something wondrous, different and often dangerous. It’s really big deal that Menolly runs away from home because being caught outside during threadfall usually results in death. Menolly is very talented and skilled. She also has the strength of will to make her own choices and deal with the consequences. When she’s living in the cave with fire lizards, she doesn’t whine and complain without end about her predicament. She’s well aware that she is there of her own volition and she makes the best of it. The problem I have with Menolly is that she’s too good at everything. She’s amazing at everything she does and I can’t help but read her for what she really is: a Mary Sue. It’s distracting. Menolly doesn’t just have a couple fire lizards, she has NINE. The reason I found the book to be a little on the boring side is that Menolly’s journey is completely predictable. The novel starts by telling us just how great she is and it continues to do so while also offering up Menolly’s ignorance at her own self-worth. It’s completely believable for a talented teen not to know just how gifted she is but to present it as the main theme of the novel give the book an underwhelming feeling since it’s painfully obvious to the reader that she is quite talented. At the same time, it’s for that very same reason this book probably works really well for young adults. Discovering that Menolly has self-worth can likely help young readers realize that they too, have self-worth. I think I’m just out of the targeted audience for this one. I appreciate it more than I like it.